Flamenco Casa Lola is situated in the heart of the Rambla, the most emblematic section of the city center of Barcelona. Close to the statue of Columbus, the Plaza Real and the Wax Museum, Flamenco Casa Lola is a spacious venue that combines gastronomy and design to pay tribute to the casual and elegant freshness of the Spanish character. 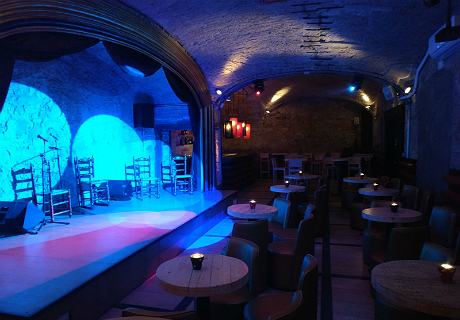 Flamenco Casa Lola offers flamenco shows where dance, song and guitar show the richness and expressiveness of this art form typical of Spanish culture. 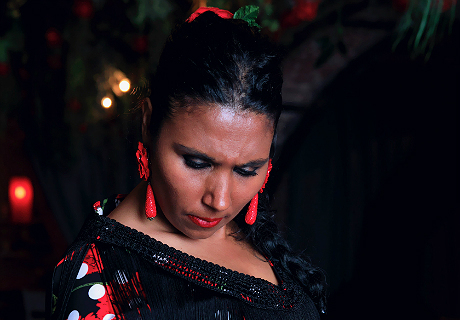 The cast of five artists of Flamenco Casa Lola is comprised of two singers, two dancers and a guitarist. 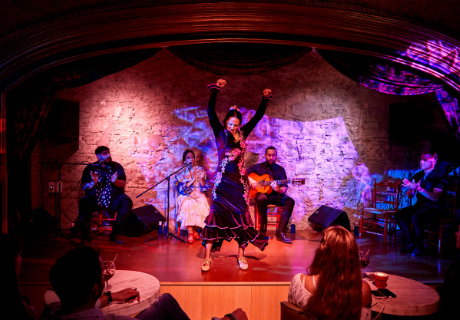 Spectators can enjoy a performance which includes a sample of the most representative flamenco styles, or palos. Tradition and innovation are the standards of Flamenco Casa Lola in both decoration and cuisine, which come together to create a stylish and cool atmosphere through the incorporation of distinctive ornamental elements such as bicolor polka dots, red flowers, comfortable and warm wooden furniture and the figure of Lola, representative of the Spanish sensuality, passion and beauty. Please select the date to see available times. Then click the next button to see the available tickets for the show. *Children: For prices please select a date/time above and click "Next". Important Observations: The tickets will not be sent by post. The confirmation email will serve as your tickets and the reservation will be held under your name at the venue. You can either print the confirmation email or present a copy of the email on a Smartphone or tablet. If you are not able to print or present a copy of the email on a Smartphone or tablet, please send us an email directly after finalizing the purchase and we will arrange entry presenting photo identification (Passport, driver's license or other national identity card).